Description: The state of Idaho is one of the most geologically diverse in the nation - from its southern desert to timbered northern mountains. Because of the rugged nature of the region Idaho's rivers have played an important role in its history and growth. River Tales of Idaho tells the stories of Idaho's rivers - from the Snake River in the south to the St. Joe in the north. Darcy Williamson takes readers from the Shoshoni Indian legend of the creation of the Snake River, to a modern-day whitewater excursion down the Salmon. River Tales includes more than fifty maps and illustrations. 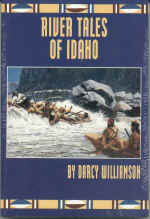 The book is a must for anyone interested in Idaho history, or those concerned about the natural resources of the region. 6x9, paperback, 344 pages, 50 maps, 12 illustrations.